Varanasi : The BHU today appointed its first woman chief proctor after her predecessor resigned taking moral responsibility for the recent violence on the campus. The appointment was approved by Vice Chancellor Girish Chandra Tripathi following the resignation of O P Singh. “Royana Singh, an assistant professor at the Institute of Medical Science (Anatomy Department), has been appointed as the Chief Proctor,” a senior Banaras Hindu University (BHU) official said. “She is the first woman in varsity’s history to hold the post and also heads the women grievance cell of the university,” the official said. The university also issued a press release confirming her appointment after Singh quit the post, taking moral responsibility for the unrest on the campus. Singh said she has “zero-tolerance” towards eve-teasing and she was “away when the incident took place”. “I was away when the incident took place. I have zero- tolerance towards such acts and will ensure nothing of this sort is repeated on campus,” she said. A number of students, including women, and two journalists were injured in a baton-charge by the police in BHU where a protest on Saturday night against an alleged eve- teasing incident turned violent. Meanwhile, BHU vice-chancellor Tripathi has visited the hostel and held talks with students. The VC has also accepted various demands of the students over their security concerns such as round-the-clock security, CCTV network, proper checking at the gates, recruitment of women security guards among other issues, according to students. Yesterday, Professor M K Singh, of the BHU Medical College, was given interim charge of the post of chief proctor. An internal four-page report by the former chief proctor and the university vice-chancellor had called the alleged act of molestation an incident of “eve-teasing”. 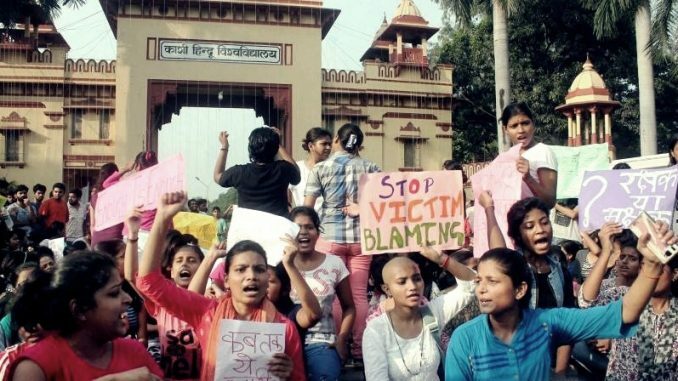 Girl students at BHU have been protesting alleging gender bias in norms, and demanding round-the-clock security, making security personnel accountable for untoward incidents targeting girls, CCTV network, proper checking at the gates, recruitment of women security guards and setting up of a gender sensitisation panel.